We ask for certain information such as your username, real name, birth date, address, phone number and e-mail address when you register for a Lifeguard-Pro account, or if you correspond with us. We may also retain any messages you send through the Service, and may collect information you provide in User Content you post to the Service. We use this information to operate, maintain, and provide to you the features and functionality of the Service. Your username and if you choose to disclose it, your real name, will be published publicly. Once published your username and / or real name may not be able to be removed. We may receive information about you from third parties. 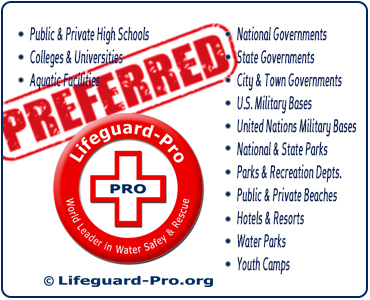 For example, if you access our websites or Service through a third-party connection or log-in, for example, through Facebook Connect, by “following,” “liking,” adding the Lifeguard-Pro application, linking your account to the Lifeguard-Pro Service, etc., that third party may pass certain information about your use of its service to Lifeguard-Pro. This information could include, but is not limited to, the user ID associated with your account (for example, your Facebook UID), an access token necessary to access that service, any information that you have permitted the third party to share with us, and any information you have made public in connection with that service. If you allow us access to your friends list, your friends’ user IDs, and your connection to those friends, may be used and stored to make your experience more social, and to allow you to invite your friends to use our Service as well as provide you with updates if and when your friends join Lifeguard-Pro. You should always review, and if necessary, adjust your privacy settings on third-party websites and services before linking or connecting them to the Lifeguard-Pro Service. You may also unlink your third party account from the Service by adjusting your settings on the third party service. 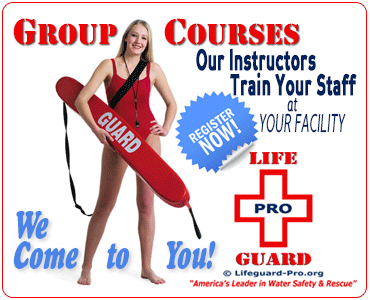 Lifeguard-Pro may, in its sole discretion, develop a feature that allows you to invite third parties to the Service. If you choose to use our invitation service to invite a third party to the Service through our “Invite friends” feature, you may directly choose a friend to invite through your mobile device’s native contact list – but we do not require that you import your contacts list to the Service, and we do not retain the information contained in your contacts list. You understand that by inviting a friend to Lifeguard-Pro through the “Invite friends” feature, you are directly sending a text or email from your personal accounts and that we are not storing your contact list. In addition, you understand and agree that normal carrier charges apply to communications sent from you phone. Since this invitation is coming directly from your email or phone, we do not have access to or control this communication. Lifeguard-Pro may, in its sole discretion, develop a feature that allows you to locate your friends with Lifeguard-Pro accounts through a “Find friends” feature. The “Find friends” feature allows you to choose to locate friends either through (i) your contact list, (ii) social media sites (such as Twitter or Facebook) or (iii) through a search of names and usernames on Lifeguard-Pro. If you choose to find your friends through your contact list, then you agree to provide Lifeguard-Pro access to your contact list such that we can perform the search necessary to determine whether or not someone associated with the information you provide is using Lifeguard-Pro. If you choose to find your friends through social media sites, then you understand that the information these sites provide to use to conduct this type of search is governed by their privacy policies and your account settings on those sites. If you choose to find your friends through a search of names or usernames, then simply type a name to search and see if that name or username appears on our Service. Note that we do not retain any information contained in your contacts list, or information from social media sites about your contacts, and we do not use such information for any purpose other than to help you find your friends on Lifeguard-Pro. When you access the Service by or through a mobile device (including but not limited to smart-phones or tablets), we may access, collect, monitor and/or remotely store one or more “device identifiers,” such as a universally unique identifier (“UUID”). Device identifiers are small data files or similar data structures stored on or associated with your mobile device, which uniquely identify your mobile device. A device identifier may be data stored in connection with the device hardware, data stored in connection with the device’s operating system or other software, or data sent to the device by Lifeguard-Pro. A device identifier may convey information to us about how you browse and use the Service. A device identifier may remain persistently on your device, to help you log in faster and enhance your navigation through the Service. Some features of the Service may not function properly if use or availability of device identifiers is impaired or disabled. We use the information we collect or receive, such as your email address, to communicate directly with you. 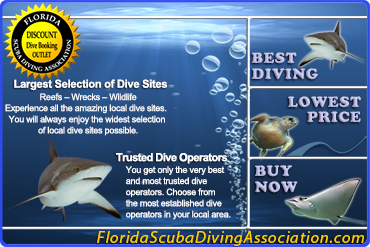 We may send you emails containing newsletters, promotions, and special offers. If you do not want to receive such email messages, you will be given the option to opt out or change your preferences. We also use your information to send you Service-related emails (e.g., account verification, purchase and billing confirmations and reminders, changes/updates to features of the Service, technical and security notices). You may not opt out of Service-related emails. You may also be able to be “found” on Lifeguard-Pro based on information that you provide (see “Find friends on Lifeguard-Pro”) above. Who can see User Content: Any User Content that you voluntarily disclose for posting to the Service becomes available to the public and cannot be removed, except by Lifeguard-Pro in its sole discretion. Once posted on Lifeguard-Pro, User Content may not be removable from public view, as copies may remain viewable in cached and archived pages of the Service, on other sites that have republished us, or if other Users have copied or saved that information. If you do not wish your User Content to be available to the public, please don’t post it on Lifeguard-Pro. Your username and if you choose to disclose it, your real name, will be published publicly. Once published your username and / or real name may not be able to be removed. Who can see your IP address: If you post User Content on the Service while not logged in, your IP address will be published with your User Content in order to attribute your contribution to the Service. A selection of Trusted Users with administrative powers on Lifeguard-Pro have the ability to review IP addresses of users to reduce abusive behavior. Any third party service embedded on Lifeguard-Pro such as an advertiser, video provider, social network or other third party will also have access to your IP address. Who can see your email address: If you enter an email address, you will enable communication from Lifeguard-Pro and other Users. If you reply to users or participate in group Lifeguard-Pro activities such as meetups, your email address will be shared with these users. In addition, some email addresses such as blocked@Lifeguard-Pro.com forward to a group of Trusted Users, who will use your email address to reply to the email. For example, Google uses DART cookies in order to deliver ads to you through the Service. Google's use of the DART cookie enables it and its partners to serve ads to you based on your visit to the Service and previous websites that you may have visited. Other advertising networks also use similar cookies, clear gifs, or other mechanisms to deliver targeted advertising to you through the Service. You can easily manually delete these cookies. You may opt out of use of Google’s DART cookie and cookies placed by Network Advertising Initiative (NAI) certified ad networks here: http://www.networkadvertising.org/managing/opt_out.asp . Opting out of these cookies will be effective not only on the Service, but on all websites with NAI certified advertising networks. However, these opt-outs will be ineffective on networks that are not NAI certified. 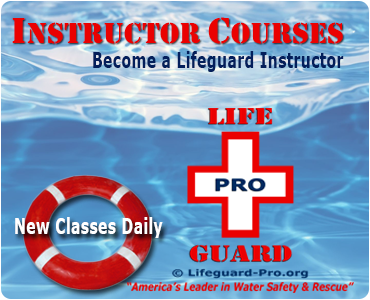 Please note that an advertiser may ask Lifeguard-Pro to show an ad to a certain audience of Users (e.g., based on demographics or other interests). In that situation, Lifeguard-Pro or our Partners determines the target audience and Lifeguard-Pro serves the advertising to that audience and only provides anonymous data to the advertiser. If you respond to such an ad, the advertiser or ad server may conclude that you fit the description of the audience they are trying to reach. 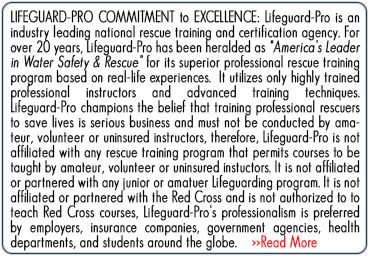 To enhance your user experience or help us improve and measure our effectiveness, Lifeguard-Pro may embed code from third parties on the Service. Examples of such parties may include Facebook, Twitter, Pinterest, Google, YouTube, Howcast, VideoJug, AOL, and others. These third parties may collect information about you including IP address, cookies in ways Lifeguard-Pro does not control. 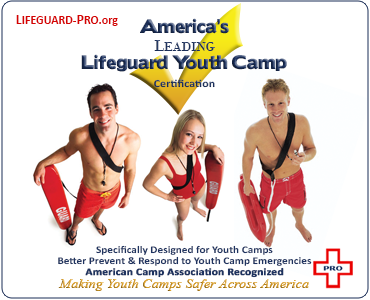 Lifeguard-Pro cares about the security of your information, and uses commercially reasonable safeguards to preserve the integrity and security of all information collected through the Service. To protect your privacy and security, we take reasonable steps (such as requesting a unique password) to verify your identity before granting you access to your account. You are responsible for maintaining the secrecy of your unique password and account information, and for controlling access to your email communications from Lifeguard-Pro, at all times. However, Lifeguard-Procannot ensure or warrant the security of any information you transmit to Lifeguard-Pro or guarantee that information on the Service may not be accessed, disclosed, altered, or destroyed. Your privacy settings may also be affected by changes to the functionality of third party sites and services that you add to the Lifeguard-Pro Service, such as social networks. Lifeguard-Pro is not responsible for the functionality or security measures of any third party. In the event that any information under our control is compromised as a result of a breach of security, Lifeguard-Pro will take reasonable steps to investigate the situation and where appropriate, notify those individuals whose information may have been compromised and take other steps, in accordance with any applicable laws and regulations. You control your account information and settings: You may update your account information and email-communication preferences at any time by logging in to your account and changing your profile settings. 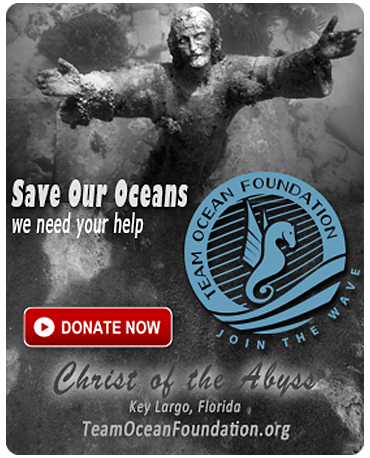 You can also stop receiving promotional email communications from us by sending an opt out request to us. We make every effort to promptly process all unsubscribe requests. As noted above, you may not opt out of Service-related communications (e.g., account verification, purchase and billing confirmations and reminders, changes/updates to features of the Service, technical and security notices). If you have any questions about reviewing or modifying your account information, you can contact us directly at info@Lifeguard-Pro.org. Please refer to your mobile device or browser’s technical information for instructions on how to delete and disable cookies, and other tracking/recording tools. Depending on your type of device, it may not be possible to delete or disable tracking mechanisms on your mobile device. Note that disabling cookies and/or other tracking tools prevents Lifeguard-Pro or its business partners from tracking your browser’s activities in relation to the Service, and for use in targeted advertising activities by third parties. However, doing so may disable many of the features available through the Service. If you have any questions about opting out of the collection of cookies and other tracking/recording tools, you can contact us directly at info@Lifeguard-Pro.org. Following termination of your User account, Lifeguard-Pro may retain your private profile information for a commercially reasonable time for backup, archival, or audit purposes. For the avoidance of doubt, any information that you choose to make public on the service may not be removable. Lifeguard-Pro does not knowingly collect or solicit any information from anyone under the age of 13 or knowingly allow such persons to register as Users. The Service and its content are not directed at children under the age of 13. In the event that we learn that we have collected personal information from a child under age 13 without verification of parental consent, we will delete that information as quickly as possible. If you believe that we might have any information from or about a child under 13, please contact us at info@Lifeguard-Pro.org.